Plose water, BioPlose juices, Tea Collection iced teas and Plose Vintage drinks are all bottled by Fonte Plose Spa. The company is involved in every aspect of bottling and does so according to the highest standards of environmental sustainability, and respect for the land on which it operates, including local values and local traditions. This philosophy has led to the construction modern facilities that bottle water and other drinks while observing the strictest rules of hygiene and preserving the exceptional natural qualities of our products. After bottling, the bottles are stored in cool, dry places until they are picked up by our distributors, who we entrust to deliver them to you. Private consumers can receive Plose products directly at home, thanks to a widespread and efficient home delivery service network. To get them go on the menu click “Find Plose”, call us at 0472 836461, or send an email to info@acquaplose.it. Our energy. From renewable sources. The electricity we use is Green Energy produced by Azienda Energetica Trading Srl. Thanks to this, our one million kWh annual energy supply is produced almost exclusively from renewable sources. This reduces our carbon dioxide emissions by over 500 tons a year. In September 1952, Giuseppe Fellin, an attentive and passionate wine merchant, visited the food fair in Parma, where he participated in conferences on the health benefits of mineral water. Giuseppe Fellin remembered that back in 1913, Vienna professors Dr. Lode and Dr. Bamberger analyzed the water springs on Mount Plose near his summer residence and found them to be of excellent quality. After testing the water himself, Fellin decided to get it professionally analyzed. He personally took a flask of the precious liquid and carried on his shoulders in a pannier down into the valley. The results of those analyses were excellent and this initiated the ambitious project of bottling the Mount Plose water. In 1953 the first inspections were carried out, made difficult by limited technology and by the remoteness of the springs. 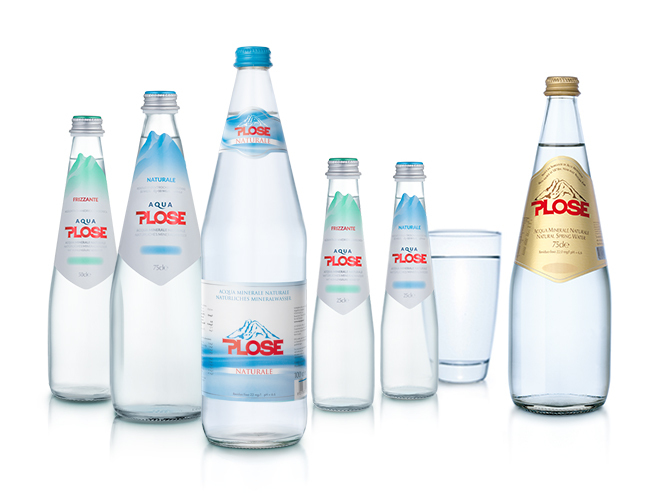 But in just four years’ time, the building from which the first bottles of Plose Water were sent was constructed. Would you like Plose delivered? Find out the distributor closest to you.